When you have suffered through a stroke, it can without a doubt make life a challenge for you. Some of the effects of a stroke can include paralysis, memory loss, speech issues, language problems, and much more. Even though these symptoms are serious, many of the effects of a stroke can be cured or at least improved through rehabilitation services in Flemingsburg, Kentucky such as Pioneer Trace Healthcare & Rehabilitation. 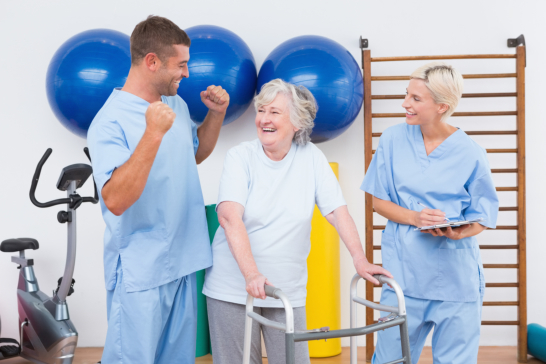 Rehabilitation is designed to help give you the opportunity to live a normal life again. We give you the means and the support to help get you back on your feet! We provide physical therapy, occupational therapy, and speech therapy. These programs are designed to help you regain normalcy in your life, so you can continue doing the many things you love to do. Just because you have had a stroke, it does not mean you need to stop doing what you love. Physical therapy is a service that is designed to help improve your physical strength, restore physical capabilities, and to quite literally help get you back on your feet as soon as possible. It is important to know that this kind of therapy is not easy, especially if you have suffered a severe stroke! It is going to take time, patience, and the willpower to gain back the life you have lost. But through our support and our guidance, we are here for you every single step of the way. Another form of therapy, you will need to take in order to help you recover from a stroke is occupational therapy. This is the kind of therapy that is designed to help you do your normal everyday things; basically, we want to restore your independence. This therapy can help you out from anything, from using a computer to being able to go to the grocery store by yourself. If you would like to find out more about rehabilitation and how we are able to help get you back on your feet, feel free to visit our website www.pioneertrace.com for more information today. Also, if you would like to ask us any questions, please do not hesitate to give us a call any time at 606-845-2131. We want to get you back on your feet just in time for mother’s day!